What I’ve come up with is surely no definitive list but it’s a start at some of the reasons. Our Department started this blog a few years ago, under Ted Trost, then chair, and Steven Ramey, who was then coordinating our public events, like the four-part lecture series they developed in 2012-13 on the so-called crisis in the humanities. This blog was seen as a place where faculty and students, not to mention the invited lecturers, might interact in the attempt to get people talking about the relevance of the humanities, as a counter-narrative to the one most frequently cited and repeated in the media — trying to make evident that since we all have a stake in this debate we likely ought not to rely on the ordained big shots writing in The Chronicle of Higher Education to be the only ones discussing it. That the blog then gradually grew into the Department’s venue for publicizing the work of its own students, grads, and faculty — implicitly keeping its eye on making evident the applicability of what we do and thus the wide relevance of the liberal arts — should be pretty apparent to anyone who follows it now. So, as a faculty member at that time, and then beginning in 2013 as the chair of the Department once again, I saw it as a worthwhile use of my time to begin blogging pretty regularly. After all, I do have a story or two in my back pocket — who wouldn’t after teaching for even just a few years. For it seems to me that good teachers have their fair share of “go to” analogies and examples that they’ve learned to draw upon in the classroom, to demonstrate a principle or to try to persuade students on a point. So why not put a few of those into print and then hit the “Publish” button? So, for starters, I blog in the hope of benefiting my Department. One of those benefits to the Department is that students can see their writing appear in public, online and linked on the Department’s Facebook and Twitter sites, maybe even liked, reposted, or commented on by people elsewhere in the country or elsewhere in the world; and when their writing appears in a blog post students see the direct impact of classroom efforts on the so-called real world (on friends and family or whomever clicks the link to see what’s new at Alabama), thereby narrowing that presumed gap between town and gown by showing them and their readers that the tools we teach allow students to say new things about the world we live in. It’s also venue for grads (who either miss what they once did in our classes or who still wish to apply those skills to the worlds in which they now live and move), to continue to contribute to what we do; and it allows faculty who post their own work to be seen as pitching in to the same collective project — sure, profs have a little more experience and a few more moves up their sleeves, but the gulf between us and students is often not as large as we’d sometimes like to think, suggesting that any time we can make evident that we are all working on the same shared problems, and doing so in common venues, is not time wasted. After all, we’re modeling for students a way of talking about the world, a way of problem solving, and a way of reasoning, so how better to do that than by sharing and building a common venue, in plain sight, where we read and comment on each other’s work? But I’m not selfless and so there’s other reasons too. For I work in that very Department — one among many on my campus, and, you may or may not be surprised to learn, not the only one where classes focus on the role of religion in human affairs; so anything that helps our Department’s faculty and students to coalesce, making it a place not only with which students and grads identify but also one identified by other profs, in other Departments, or by administrators at various levels of the hierarchy, able to see us as a cohesive site of innovative and earnest (yes, at times, fun) activity, well…, that benefits me pretty directly, for, like my colleagues, I enjoy doing what I do and so I’d like to see this unit around for a good long time. Moral of the tale: social groups (from nations to university Departments and even families) don’t exist of their own inner momentum. The blog is therefore one among many interconnected sites where we not only study social formation but carry it out. But it benefits me in other ways too; it gets me writing pithy posts on a fairly regular basis and I’ve subsequently spun a variety of them into other projects — case in point, several of the chapters in my most recent essay collection cite my blogs in the footnotes, to make plain where small portions of some of its chapters first began life. Some of my work in journals and books is known already but this venue also benefits me by bypassing the bureaucracy of publishing (it takes months or years to get some pieces into the hands of readers) by providing me with a direct and instantaneous publishing venue. Sure, I don’t have a copyediter (wink) and it’s not peer-reviewed, but this isn’t a book or an academic essay and, besides, one can find that literature elsewhere if that’s what you’re wanting to read. (Did you see that I’ve already linked to one of my books?) And who knows, maybe that’s where some enterprising readers will go when they log off the computer after having read a post that got them thinking about something. So, like Bruce Lincoln once said to me, long ago, publishing is like putting messages into bottles and throwing them into the sea — who knows what will come of it. So goes blogging as well. 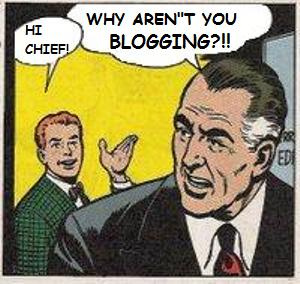 But I blog for another reason. Over the past couple of years there’s been an increasing emphasis on the problems created by pay walls at online journals, portraying them as impediments to the (literally) free exchange of ideas. While I’m not going to single-handedly overturn the industry that is print capitalism (an industry that I, as a published author, participate in, to be sure), I made a conscious decision to spend at least a couple years putting real energy into professional but public, online writing, as bit of an experiment. There’s now well over 500 posts of mine floating out there in cyberspace, between this site and another where I also blog with 6 other scholars of religion (along with a small handful in other places online, like this) — some are substantive and others are far briefer, of course (maybe an image juxtaposed with a provocative quote from someone), but the vast majority are discrete examples of the sort of scholarship I’ve argued for all along, making each a little exercise in how to handle an e.g., how to see our objects of study as normal and mundane rather than unique and essentially interesting. It helps my work (writing and teaching) to do these little writing exercises and, who knows, it might be just the sort of accessible, quickly read model that readers need to connect a few dots of their own, to get them moving along a different way of talking about how to study the world. — there’s also research that I’d like to think of as being no less useful or innovative but which is just posted in public, free of charge, for anyone to read, so long as they have a computer and internet access. That I’ve already jumped many career hoops and carry a variety of (for good or ill) imprimaturs on my C.V. (i.e., he worked there, he’s published here, etc. ), means I have some freedoms with what I do with my time and writing that others don’t have. I know that. (Aside: as a Department Chair with a variety of service obligations on campus I also have constraints on my time that others don’t have too — meaning it all might be a wash at the end of the day and that we’re all busy no matter how you slice it.) But, yes, if I was much earlier in my career I’d likely not be posting as energetically as I do. For the profession doesn’t award tenure and promotion for posting a witty gif or a timely two or three paragraphs on something in the news. Whether it should is another conversation, but that doesn’t mean that blogging and social media in general are irrelevant. Consider that a forthcoming volume I’ve edited is a collection of rewritten blog posts from the members of Culture on the Edge (that other blog I mentioned above), each of which is followed by a commentary by an early career scholar who, in almost all cases, I first met when they friended me on Facebook — having read me in class they found me online. Several of them regularly blog too and so I was able to identify almost ten near strangers as contributors to a book through reading their blogs, their online comments, and by messaging with them about what they worked on. It seems to me a logical extension of what I do in all of my professional life: work with others to model a certain way of thinking about human subjects, what they do and what they leave behind after they’re gone — doing that modeling on a public catwalk without a net, where others can be the judges, deciding if they like my style or which struts of their own they’d prefer to use. This entry was posted in Faculty Blog, Relevance of Humanities, Religion in Culture and tagged Blogging, Relevance of the Humanities by Russell McCutcheon. Bookmark the permalink.